Hey Dude was Nickelodeon's first original live-action television series which aired from 1989-1991. 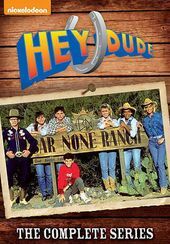 Set at the fictional Bar None Dude Ranch in Tucson, Arizona, the show focused on the predicaments that the teenage staff and the ranch owner, Mr. Ernst, got themselves into. The show was one of the most popular shows on Nickelodeon at the time and is missed by many.